The Baseball News Source Top MLB Prospects of the Week report is a weekly rundown on the Top 10 prospects from each one week period, reported to you each Sunday. This is not meant to be a list of the top prospects in the game, rather this is a report of the prospects who had the best performances based on talent/ability level, respective league difficulty, and progression (as well as projection) throughout the one week period of June 22 to June 28. 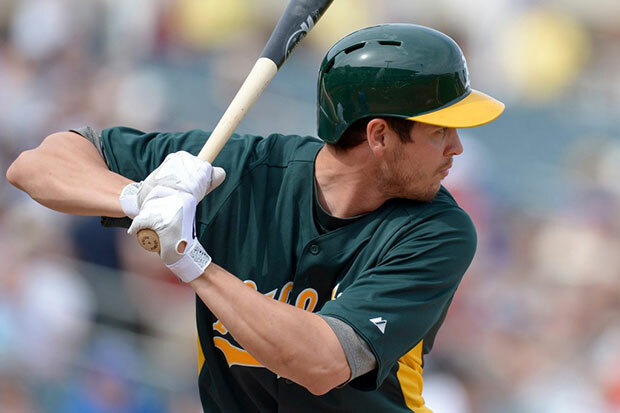 A first-round draft pick (13th overall) in the 2009 MLB Amateur Draft out of the University of Southern California, Green has showcased a consistent bat and athletic approach to the game across multiple levels of the Athletics’ minor league system. Coming into Saturday, Green was in the midst of an eight-game hitting streak that included the likes of seven multi-hit games, highlighted by a four-hit performance against Colorado Springs on June 23 and a two-home run performance against Reno on Thursday. After spending time as an outfielder and shortstop, Green has found his niche at second base. Green is a versatile player at second, bringing decent speed, defense, and offensive ability. He projects as an everyday fixture at second and is ready to make the transition to the big leagues, although his pathway is currently blocked by Eric Sogard, who has been decent as the starter at second. However, Green should be on standby in the event Sogard goes down with an injury, as the depth at second is relatively thin in the Oakland system. Heading into Saturday, Franco holds onto a 16-game hitting streak that dates back to early-June. Franco has made a successful transition to Double-A ball, hitting .474 with three home runs and eight RBI in nine games since receiving the promotion to Reading on June 20. Since rebounding in the second half of last season with Low-A Lakewood, Franco has been on a tear as he has progressed quickly through advanced Class-A ball and is currently excelling in Double-A ball. Franco has the potential to develop decent pop with decent hitting ability and should become a solid defensive stalwart at the hot corner as he possesses a plus arm and the intangibles to provide a good offensive/defensive combo at third. Sampson turned in a gem on Wednesday, working eight scoreless innings and striking out a career-high 12 batters en route to his fifth victory of the season. Sampson also made a spot relief appearance in between starts on Sunday, pitching a perfect fifth inning for the Missions. Sampson has improved greatly over the past few seasons in the San Diego system, developing into a solid starter with command of a four-pitch arsenal that is highlighted by a solid low to mid-90s fastball and a changeup that has plus sinking action. Although he needs to work a bit more on his control, Sampson has made leaps and bounds with his command and development since the second half of last season, as he should expect to receive his big league call-up sooner rather than later. Cabrera received his big league call-up late last season, as he served as a reliever for a Chicago bullpen that desperately needed the help. Since the Cubs have received solid help from their pitching staff this season, Cabrera has spent the 2013 season with Double-A Tennessee, which has appeared to pay off for both Cabrera and the Chicago organization. Cabrera was put back in the starting rotation and has been solid in 15 games this season, highlighted by his most recent start in which he pitched eight innings and struck out a season-high 13 batters. Expect to see Cabrera rejoin the Cubs staff at some point later this season or in early 2014. Since receiving a promotion to Triple-A Colorado Springs following Corey Dickerson‘s big league call-up, Matthes has been on an offensive tear for the Sky Sox. In his first game with the club this past Saturday, Matthes went 4-for-4 with a home run and four RBI and has kept at that pace over the past week. A fourth-round draft pick out of the University of Alabama in 2009, Matthes has had his ups and downs in the Rockies organization. Matthes appears to have jumped onto a more consistent path this season and at age 26, should be a in a prime position to get his first taste of the big leagues in the near future. Atlanta was optimistic in their hopes for Terdoslavich after drafting him in the sixth round out of Cal State Long Beach in 2010, but was inconsistent in three seasons prior to the 2013 season, highlighted by a 2012 campaign that saw the Atlanta prospect hit .180 in 53 games following his promotion to Triple-A ball. Terdoslavich has rebounded with a solid season, as witnessed by the past week in which he has tore up International League pitching by belting three homers and driving in seven runs while batting .440. He has solid power potential and good plate discipline, while boasting a a strong arm that can be utilized at either third or in the outfield. With his progression this season, Terdoslavich should see big league action in the near future, as Atlanta may wish to platoon him in the outfield. After a slow start in rookie league and Low-A ball, Moya has appeared to right the ship over the past two seasons as he has had a decent season with High-A Lakeland. Coming off of Tommy John surgery that derailed a good portion of last season, Moya has been impressive in recent weeks, capped by this past week where he launched three homers and drove in 10 runs, boasting a .393 batting average and sizzling 1.344 OPS. Moya is still young and needs improvement on his plate discipline, but the Tigers are still very optimistic about the potential of the big man (6-6, 230), as he possesses excellent raw power and has the athleticism and tools to become a solid staple in the outfield at the next level. The top pitching prospect in the Giants organization has been dominant in his return from the disabled list this season, coming off of a strong outing in which he worked 5 1/3 scoreless innings and struck out eight batters, adding to a season where he has posted an impressive 0.48 ERA in five starts for High-A San Jose. Crick has the pitching ability and raw talent to become a front of the rotation starter, as he possesses a plus fastball and strong off-speed offerings that will continue to develop as his command improves. He has a strong frame (6-4, 220) and is very athletic and with the proper development should be a quick learner in the minors and will be an instant asset to the Giants’ starting rotation in the future. After being signed by the Twins out of Germany in 2009, Kepler has tapped into his plus raw talent over the past two seasons in rookie league and Low-A ball. Kepler is a toolsy player with solid power potential, hitting ability, and defensive upside, wherein he is already hitting his offensive stride at the young age of 20. Kepler has missed much of this season due to injury, but has been strong in his return over the past two weeks. This past week, Kepler slugged two homers and drove in seven runs, while posting a .320 batting average and 1.073 OPS in six games for Cedar Rapids. If all goes well, Kepler should develop into the solid, toolsy outfielder at the next level that the Twins envisioned four years prior. Pounders is not considered one of the top pitching prospects in the Baltimore system, but he sure pitched like one on Thursday as he tossed a no-hitter against the Midland RockHounds. If it weren’t for a fielding error, Pounders would have walked away with a perfect game. Nonetheless, Pounders’ masterful outing was the second individual no-hitter in the minor leagues this season, as Lenny DiNardo tossed a no-hit gem of his own earlier this season in the Atlantic League. Due to the historic significance and dominance of the outing, Pounders gets the nod at number ten, capping off a week of solid performances by some of the top prospects in professional baseball.